You can use your Queensland Seniors Card, Seniors Card +go or Seniors Business Discount Card at thousands of participating businesses throughout Queensland. If you hold a Queensland Seniors Card or Seniors Card +go, you may also be eligible to access Queensland Government concessions. Use the online discount directory to search for Queensland discounts by card type, location, or discount category. For more information phone 13 QGOV (13 74 68). If you have difficulty obtaining a discount from a participating business, call Card Services at Smart Service Queensland on 13 QGOV (13 74 68). Each Australian state and territory has their own Seniors Card scheme and some reciprocal arrangements are in place for using your Queensland Seniors Card in other states. Businesses in one state will generally recognise cards from another, however, it is best to ask the business if it provides a discount for interstate Seniors Card, Seniors +go and Seniors Business Discount Card holders before making a purchase. To find out more about participating businesses and available discounts in other states, you will need to contact the relevant interstate Seniors Card office. 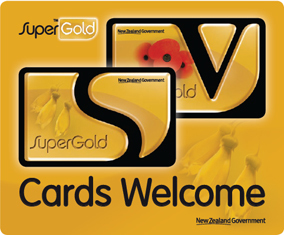 Look for the “SuperGold Cards Welcome” sticker in New Zealand businesses and ask if they also accept Queensland Seniors Card, Seniors +go and Seniors Business Discount Cards. A reciprocal agreement between the Queensland and New Zealand governments gives Queensland Seniors Card, Seniors Card +go and Seniors Business Discount Card holders access to discounts and special offers on goods and services from businesses participating in the New Zealand SuperGold Card program. Access to government concessions is not included. Search the SuperGold online discount directory or look for the “SuperGold Cards Welcome” stickers when travelling in New Zealand, and ask the salesperson if they also accept the Queensland Seniors Card, Seniors +go or Seniors Business Discount Card. If a business does not offer discounts for Australian seniors, this will be noted on their website under ‘exclusions’. If you hold a New Zealand SuperGold Card or a Seniors Card issued by another Australian state or territory and are travelling to Queensland, you can search the online discount directory to find businesses offering discounts to visiting interstate and overseas cardholders. The Queensland Government offers concessions on services such as transport and motor vehicle registration, health, recreation and education. View all available Seniors concessions and rebates on our Smart savings website. Concessions are also available on home energy supply. You will need to speak with your service provider about individual discounts. Utilities rebates are available for Queensland pensioners and seniors. You can now combine your Seniors Card with a go card. It's free, easy to get and easy to use.